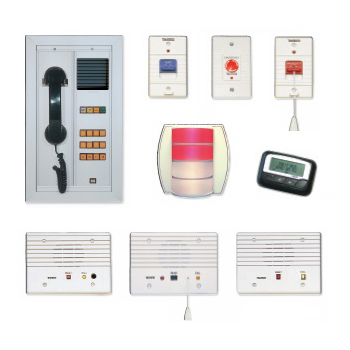 The Tektone NC150 and Tektone NC200 nurse call systems are audio-visual systems with two-way communication between patients and staff for assisted living facilities, nursing homes, hospitals and other healthcare facilities. The Tek-CARE direct-select master stations include illuminated buttons for every station within the facility. The Tektone NC150 and NC200 are efficient and affordable nurse call systems that allow staff to communicate with patients without the need to enter their room. The Staff Follow function can be included to increase staff mobility within the facility. The Tektone NC150 nurse call system can be mounted to the wall or to a desk. The Tektone NC200 is mounted to a desk and includes 10-station Group Call and has a paging system. The remote stations in the Tektone NC150 and NC200 nurse call system packages can be used as remote annunciator panels. These Tek-CARE remote stations can be mounted to the wall. The benefit of remote master panels is that staff can check for their next call without being paged or without having to travel to the main annunciator panel. The Tektone NC150 and NC200 nurse call systems allow for efficient and quick means of communication between patients and staff through these remote stations. There are no children categories of TekTone NC150-200 Nurse Call.